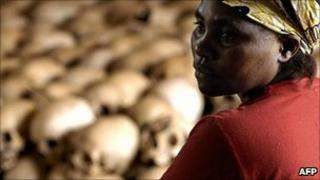 Most of the dead were Tutsis - and most of those who perpetrated the violence were Hutus. A French judge has blamed current Rwandan President, Paul Kagame - at the time the leader of a Tutsi rebel group - and some of his close associates for carrying out the rocket attack. But the death of the president was by no means the only cause of Africa's largest genocide in modern times. The two ethnic groups are actually very similar - they speak the same language, inhabit the same areas and follow the same traditions. At the same time, Tutsi refugees in Uganda - supported by some moderate Hutus - were forming the Rwandan Patriotic Front (RPF), led by Mr Kagame. Their aim was to overthrow Habyarimana and secure their right to return to their homeland. When Habyarimana's plane was shot down at the beginning of April 1994, it was the final nail in the coffin. Exactly who killed the president - and with him the president of Burundi and many chief members of staff - has not been established. The day after Habyarimana's death, the RPF renewed their assault on government forces, and numerous attempts by the UN to negotiate a ceasefire came to nothing. Rwanda's now Tutsi-led government has twice invaded its much larger neighbour, saying it wants to wipe out the Hutu forces. The world's largest peacekeeping force has been unable to end the fighting.